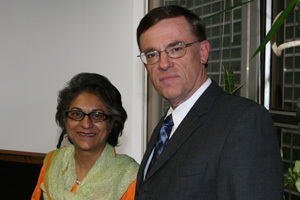 International Religious Liberty Association | "Objective criticism of religion is a human right," affirmed Ms Asma Jahangir, United Nations special rapporteur at a meeting in New York on October 25. "Objective criticism of religion is a human right," affirmed Ms Asma Jahangir, United Nations special rapporteur at a meeting in New York on October 25. News October 2007, New York, NY, USA – She was speaking at a special meeting of the United Nations Non-Government Organization Committee for Freedom of Religion or Belief. Her remarks come after intense debate at the UN, especially at the Human Rights Council, on this issue of defamation of religion. Jahangir's mandate is as special rapporteur for Freedom of Religion or Belief. "Mine is a contentious mandate," she commented, "and defamation of religion is the current contentious issue. Additionally, there is not a consensus among states on fundamental issues, such as conversion. Some are not willing to accept the idea of leaving a faith community." She went on to discuss the defamation issue, observing that many religious people believe they alone have the truth, with the idea that "my religion is better, is superior." Religion is sometimes compared to race, she said, and the provisions against racial hatred are then applied to religion. But, she observed, "religion is unlike race--you cannot proselytize to change one's race. There are serious differences." Jahangir was also concerned that "defamation is sometimes stretched to include criticism. If some definitions of defamation are adopted, social norms based on religion could not be debated. Defamation is an issue of civil law, not a violation of human rights." She also critiqued blasphemy laws which are used to silence dissent, commenting that "religion can be used as a tool of fear, used against minorities, and to crush internal dissent." Responding to a question from Dr. Jonathan Gallagher, UN Liaison director for the International Religious Liberty Association, on how to support her mandate, Jahangir said that help with research was very important. She mentioned as an example information provided on the blasphemy issue that was extremely helpful for an upcoming meeting. "The better prepared the mandate holder is, the better they can function," she commented. Jahangir has recently completed country missions to the United Kingdom and Tajikistan. Upcoming missions are to Angola, Israel, India, and Turkmenistan.